· We cannot ship this product to Maine. The Bala Shark, also known as the Silver Shark and is great for the semi-aggressive community aquarium. This is one of the more passive freshwater sharks, and they are an active fish that will be visible during the day. The Bala Shark is a beautiful fish with a metallic silver body with a yellow and black dorsal and caudal fin. It requires a large aquarium with driftwood, rocks, and spots of dense vegetation. This shark does best in small groups of 3 or more, as they prefer to school in the aquarium. Unfortunately, the breeding habits of the Bala Shark have not been documented. An omnivore, the Bala Shark is not a particularly finicky eater. Flake food, freeze-dried bloodworms and tubifex, as well as vegetable-based foods should be fed. Approximate Purchase Size: Small: 3/4" to 1-1/4" Medium: 1-1/4" to 2"
I have one shark. It hangs around with swordtails. it is the only suvivor out of 8. They STRESS QUICKLY hitting the walls at times. Extra care should be taken when children are present in the home. I have kept Bala Sharks for years and have just two suggestions you should remember about them: First, keep them in groups of at least four. They are schooling fish and keeping them in numbers will help them thrive in a tank of more aggressive fish like cichlids. Secondly, keep a tight fit on the tank and do not scare them when cleaning. These fish can jump up to six feet high out of your tank! They won't survive hitting the floor, so keep a patient, gentle demeanor when cleaning. I like my two Bala Sharks. Their care level is easy for me and I like their color. I have them with gouramis, barbs and tetras. They all like each other. I recommend them to everybody! These fish are great, and very entertaining to watch! They are always moving around - and believe me they can move! I started my tank with only 2 of them and they didn't do much. As soon as I added another three, they were lively as can be. Make sure you keep them in a group so you can enjoy these great fish! Bala Sharks are peaceful but skittish fish that require a lot of room to swim at high speeds. They are also schooling fish that need companions. This is key for the best keeping of this fish, as mine have actually maxed out at 14", not 10". They also lose their slender, minnow-like form and grow deeper, so they require a tank that is both tall and long. I wouldn't recommend this species for anything lower than a 75 gallon tank, anything less will stunt the animal. I've kept this species for years and it really is a treat if you can provide the room it needs to thrive. A great fish to have - if you are a fan of track & field. One of my two jumped out the other night - good h2o conditions, good food - just a pure Olympian. These fish are great as long as a full cover is on the tank. I have three Bala Sharks in my 75 gallon tank. Two of the Sharks are fairly young and the other is about 3 years old. He is the biggest fish in my tank (about 7 in.) and shows no agression to any other of the fish in my tank. Actually, I found that my Giant Danios are more agressive then my Bala Shark and the Danios are 1/3 the size. I would highly recommend that you do keep the lid on as much as you can because they do jump and I did lose one other 8 Inch shark while I was cleaning my tank. They are very easy to care for and eat the left over shrimp pellets I feed to the fish. I would recommend this fish to any one. These sharks are very hardy animals. They swim with the other fish and tease each other. They are not hard to care for but they need at least a 20-gallon tank for sufficient swimming room. Enjoy! 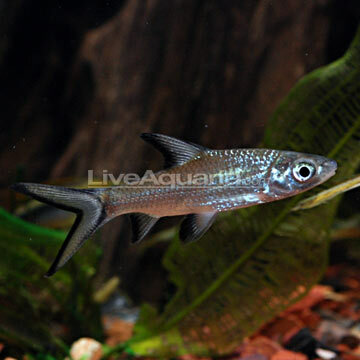 I have three 7" Bala sharks, and they are truly amazing fish. They get along well with my Barbs, Pictus Cats, and Clown Loaches. I would recommend them to anyone who wants to add color and life to their setup. My four Balas are wonderful community fish. They're great for after-dinner cleanup, as they scavenge the rocks and filters for leftover food. Not only do they enjoy schooling with each other, they will individually school with my six Black Skirts too! Get some today! These guys are AWESOME! When I gave my father a 55-gal tank for Father's Day, I gave him my Bala Shark. That was over four years ago and the fish is still with us! He has always been a gentle fish, even though he's HUGE! He has jumped out of the tank a few times so be careful when you're cleaning/feeding. He has been a favorite with all of us - you can not go wrong with this species. I have three Bala Sharks and they are great fish. They get along with all types of fish and are very graceful swimmers. Overall, a great fish to add to a community tank! These fish are beautiful to watch and grow really big. I had a group of 5 16" Bala Sharks. These fish are good survivors. However, from experience, these fish will not do well in cold water and they do jump high so I recommend covering the tank. These fish are capable of living along time if cared for properly. I had all 5 live for six years. This is a really great and beautiful fish and will eat almost any type of food. Hundreds of articles to help you with your aquarium.